In a book review of The FBI and Religion: Faith and National Security Before and After 9/11 (2017) in the Christian Century, Research Fellow Jerome Copulsky writes that J. Edgar Hoover's influence was even farther reaching than we know. 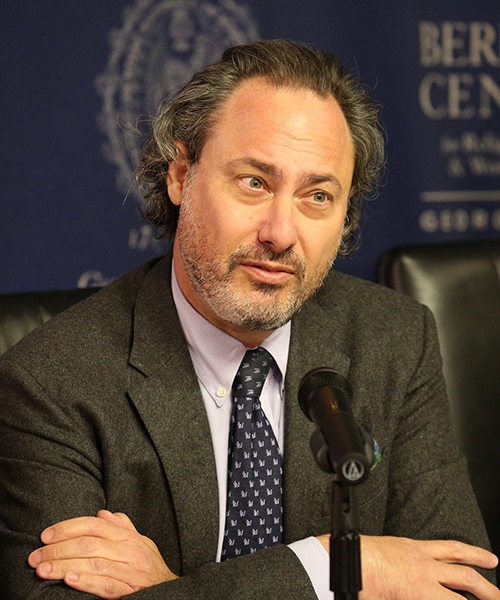 Jerome Copulsky, a Berkley Center research fellow, specializes in modern Western religious thought, political theory, and church/state issues. He is currently working on project on American civil religion and its discontents. From 2016 to 2017, he was the American Academy of Religion/Luce Fellow and senior advisor at the U.S. Department of State's Office of Religion and Global Affairs. He previously directed the Judaic Studies programs at Goucher College and Virginia Tech, and also taught at American University, the University of Massachusetts (Amherst), and Indiana University. His scholarly work has been published in the Journal of the American Academy of Religion, the Journal of Religion, Political Theology, and Perspectives on Political Science, with essays in Political Theology for a Plural Age (2013) and Judaism, Liberalism, and Political Theology (2013). His writing has also appeared the Atlantic, Christian Science Monitor, Washingtonian, Jerusalem Post, Jewish Review of Books, and Religion Dispatches. Copulsky earned a B.A from Wesleyan University, an M.F.A. from Columbia University, and a Ph.D. from the University of Chicago.